Mullah Mohammed Omar was a reclusive figure even before his Taliban government was driven from power in late 2001 and he was forced into hiding - very few images of him exist. There have been several reports in the past that Mullah Omar had died. Afghan government sources have now told the BBC that he has been dead for two or three years, although this has not been confirmed by the Taliban. In April the Taliban published a biography of Mullah Omar, saying he was alive and still supreme leader of the movement, as he had been since 1996. A statement purporting to be from Mullah Omar was released in July backing peace talks with the Afghan government. The last audio message thought to be from him appeared in 2006 but even this was leaked and not meant for public consumption. He had not made a public appearance in very many years and former BBC journalist David Loyn - one of very few Westerners ever to have seen him - said that even among other Taliban, he did stand out. It was Mullah Omar's backing for al-Qaeda leader Osama Bin Laden that brought the US-led campaign to oust the Taliban. He and most of the other senior Taliban leaders, along with Bin Laden and some of his senior al-Qaeda associates, survived the American onslaught. Bin Laden was finally killed in a covert US commando raid in the Pakistani town of Abbottabad in May 2011. Since then Mullah Omar had been thought to have evaded capture, despite one of the largest manhunts in the world. The late US envoy for Afghanistan and Pakistan, Richard Holbrooke, said he believed Mullah Omar was in hiding somewhere along the rugged border between the two countries. Others believed him to be hiding within Pakistan, something officials in Islamabad deny. The ties between Mullah Omar and Bin Laden went back to their time as resistance fighters against the Soviet occupation of Afghanistan of 1979-89. Mullah Omar vigorously defended his friend against allegations that he masterminded the devastating attacks on the World Trade Center and the Pentagon, accusing the US of trying to cover up its own intelligence failures. Bin Laden is believed to have at least partially financed the Taliban takeover of Afghanistan. It was even thought that Mullah Omar had taken Bin Laden's eldest daughter as a wife, and that Bin Laden may even have taken one of Mullah Omar's daughters as a fourth wife. The Taliban always denied this. Mullah Omar was only a small-time commander in the forces resisting the Soviet occupation. He never did any practical field commanding during the Taliban's 1994-96 blitzkrieg that culminated in their capture of Kabul. But the localised uprising that he led against former Mujahideen warlords in the Kandahar area in 1994 earned him wide respect and is regarded by some as a catalyst for the Taliban movement that followed. 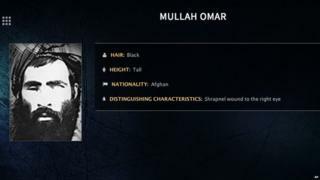 He emerged from the Taliban takeover of Afghanistan as their undisputed leader or "commander of the faithful", a title with great resonance in Islamic history. No Western journalist has ever met Mullah Omar, who left virtually all contact with the outside world to his foreign minister, Wakil Ahmad Mutawakkil. To many ordinary Afghans he is just a name, but those who have seen him say he would be about 50 - and tall, with a black beard and a black turban. His right eye was damaged by shrapnel when he was fighting Afghanistan's Soviet occupiers in the 1980s. When the Taliban were in power he rarely left the southern city of Kandahar, where he lived in a large house that was reportedly built for him by Bin Laden. The two were reported to have spoken daily by satellite telephone, and some reports suggested they also met for fishing trips. Under Mullah Omar's rule, a strict interpretation of Islamic law was imposed on Afghanistan under Taliban control. Women were strongly discouraged from leaving their homes, denied schooling and jobs and forced to fully cover themselves. Women found guilty of adultery were stoned to death, homosexuals were crushed under brick walls, thieves' hands amputated and those accused of murder publicly executed by victims' families. Edicts from Mullah Omar included the death sentence for anyone converting to another religion, as well as the infamous orders to destroy the country's ancient Buddha statues at Bamiyan. The Taliban's fall from power was a far cry from the optimism that greeted their arrival in Kabul in the mid-1990s, when many ordinary Afghans welcomed them as heralding an end to the chaos caused by years of civil war.